Brown sugar is a sucrose sugar product with a distinctive brown color due to the presence of molasses. It is either an unrefined or partially refined soft sugar consisting of sugar crystals with some residual molasses content, or it is produced by the addition of molasses to refined white sugar (so called Molasses Sugar). Brown sugar contains from 3.5% molasses (light brown sugar) to 6.5% molasses (dark brown sugar) based on total volume. Based on total weight, regular brown sugar contains up to 10% molasses. The product is naturally moist from the hygroscopic nature of the molasses and is often labeled as "soft." The product may undergo processing to give a product that flows better for industrial handling. The addition of dyes and/or other chemicals may be permitted in some areas or for industrial products. In the late 1800s, the newly consolidated refined white sugar industry, which did not have full control over brown sugar production, mounted a smear campaign against brown sugar, reproducing microscopic photographs of harmless but repulsive looking microbes living in brown sugar. The effort was so successful that by 1900, a best selling cookbook warned that brown sugar was of inferior quality and was susceptible to infestation by "a minute insect. Visit and join the recipe group on Facebook, named “Kitchen Chew”. You will be glad you did. Amazing folks and food. This recipe group will have you drooling. Visit and like Christine's Pantry on Facebook. Place potatoes in a pot, cover with water, bring to boil, cook until tender. Drain and let cool. Place potatoes in a bowl. In a large skillet, heat the 2 teaspoons oil over medium high heat. Add crushed red pepper. Add onions and keilbasa, cook until onions are tender. Transfer to a paper towel lined plate to drain. Add kielbasa and onions to the bowl with the potatoes. For the dressing, in a small bowl, combine light brown sugar, spicy mustard, thyme, garlic, salt and pepper, slowly whisk in 3 tablespoons olive oil. Add the dressing to the potato mixture and toss to combine. Serve warm or at room temperature. Enjoy! 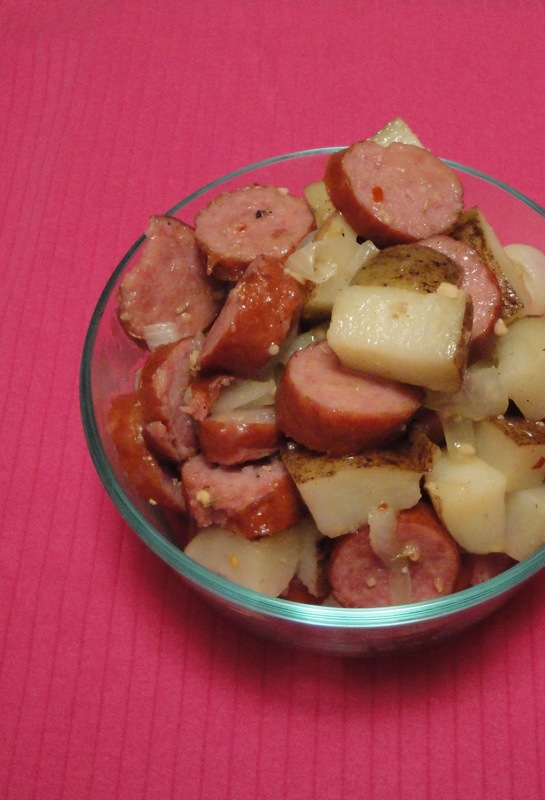 I never tried to add sausage into potato salad. Looks great. :)Have a wonderful weekend! I never would've thought to put brown sugar in a potato salad. Thanks for the tip! trying to print these recipes and can't find where to find where it says PRINT. If you have the program "word", you can copy and paste, then print. You can email the recipe to your self, then print. You can also print from your browser. I'm working on finding a plug in to make it easy for people to print.